1st Gear: Remember When Chrysler Was Going To Kill The Viper? 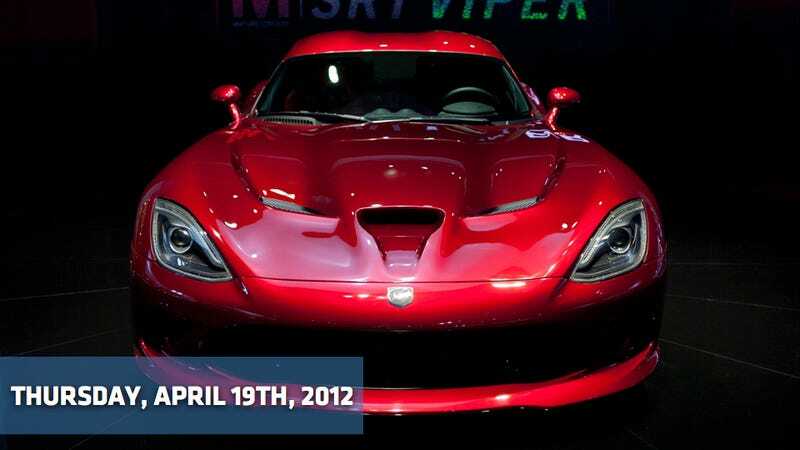 Peter Valdes-Dapena over at CNNMoney reminds us that the story of the 2013 Viper — is a pretty amazing comeback story. It's a car once counted as dead that came miraculously back to life — sort of like Chrysler itself. Remember back in 2008, Chrysler was ready to sell the Viper off as a platform to almost anyone who'd buy them. Then, a year later, it was alive again, and then it was designed after a naked woman. It was a rough ride since first being introduced in 1992 for the V-10-powered Dodge Viper (Oh yeah, remember when it lost that name last year?) — a supercar originally pushed by iconic automotive super-executive "Maximum" Bob Lutz, and despite an avid fan base was never a huge seller. "It wasn't until the new management came in that we looked at everything we had and I thought it was a good idea to say 'Hey, we have this car,'" said Ralph Gilles, head of Chrysler's SRT performance division. Read the full story here. 2nd Gear: Is Audi Overreaching With Ducati Purchase? Not everyone agrees that the purchase of Ducati by Volkswagen Group's Audi is the automaker's smartest idea. Bloomberg tells us that some see the $1.1 billion deal for the exotic Italian motorcycle maker is overreaching by CEO Ferdinand Piech. Especially given that the addition of Ducati isn't likely to add much to the company's bottom line and may prove a distraction for Piech, who is already working on the integration of Porsche AG. "The Ducati deal shows that Piech is an engineer and engineers are sometimes like little babies," said Ferdinand Dudenhoeffer, director of the Center for Automotive Research at the University of Duisburg-Essen and one of the most influential observers of the German auto industry. "It's a new toy." But it's a really cool toy! When Tata Motors bought Jaguar and Land Rover in 2008 for $2.5 billion from Ford, investors greeted the announcement by selling its stock. Those who held on may be sitting on a jackpot. The two British luxury car brands are worth $14 billion, according to the average estimate of three analysts surveyed by Bloomberg. That's more than Fiat! Now, with a planned $12 billion in capital spending and product development over five years and a proposed partnership with Chery Automobile for expansion in China, conditions are right for an IPO, according to Fim Asset Management Ltd. and Kim Eng Securities Pvt. When news broke Monday that Ford would be killing the "retro" in their next-generation Mustang, it made us ask the question "What was the worst special edition Ford Mustang?" The responses were epic — and gave us this great listicle of the ten most disgusting 'stangs. Jonathan Welsh at the Wall Street Journal had the same response — penning a piece yesterday on the spotty history of Mustang redesigns. Fox body anyone? It's worth a read — especially as I completely agree with his love for the SVO. Volkswagen has made a point of getting along with the state of Tennessee, home to the automaker's Chattanooga plant, but it apparently draws the line when it comes to a new bill in the state's legislature that would allow employees to store guns in their cars on company property while at work. "That's a sort of thing that makes us a bit nervous," Frank Fischer, the CEO of the automaker's in-state operations, told the Associated Press. "We would not welcome people being able to carry weapons on factory grounds, probably just as little as the state House or Senate would like people to enter their building armed." The measure has the support of the National Rifle Association, which considers vehicles an extension of workers' private property, no matter where they are parked. The Tennessee Senate's version of the bill would limit the ability to carry guns in vehicles to those with state-issued handgun carry permits or state hunting licenses. Hunting licenses are available on the Internet for $27. See, where's the problem? Silly Germans, always so afraid of people packing heat. General Motors reached a deal to restore its joint venture with its top Chinese partner to a 50-50 split, making the two automakers equal players in the arrangement, the company confirmed. GM and Shanghai Automotive Industry Corp. (SAIC) will each control 50% of the venture, with SAIC owning 51% of the sales venture. The deal would still have to be approved by Chinese governmental agencies, which govern partnerships between domestic and foreign auto companies.